1st place in Greyscale Gorilla's 5 Second Project contest under the Monster Bash theme. 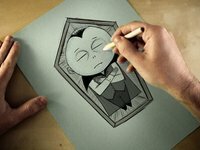 António Silva's animation is a 5 second story about a little vampire that comes to life in paper and gets bashed with a poetic wooden stake - a pencil. visit www.puppyclub.com for more fun.